3rd: 1-4-6-8…Wide open race with no clear direction here, but I finally settle on Mighty Mad (1). If this gelding can find his form from last fall, he will be salty here. Also gets a mud mark. Coach’s Dream (4) is a first time starter for a barn that does get them geared up early, if they have speed. Trainer-jock duo does well together. Big jock change on After The Goldrush (6), but this will be his 13th try to break the maiden. Cowboy Quinn (8) is a long shot that I throw in. I bet the 1 to win/place and box in the exacta 1-4-6 and 1-4-8. 4th: 9-8-7-1…Hope this tilt stays on the grass, and if it does, I go with Six Schillings (9). You can throw out the last when he encountered all kinds of issues. Not necessarily the strongest finisher, but has run against some good ones, like Bullagh Rocks. Space Mountain (8) is a first time gelding and does like a yielding course. Should be the favorite here, but the rider is ice cold and its been awhile since he was close at the end. Hardly Home (7) moves up a couple of notches in class after being claimed in his last off a dynamite outfit. This could turn out to be a nice pickup for this barn, who names Lanerie to ride. Knight’s Dream (1) exits a maiden win, but could be OK. I box the top three in the exacta (9-8-7) and then box the 9-8-1. I play the 9 to win/place. 5th: 5-1-6-7-2-3…High Street (5) hesitated at the start in her lone try to date and drops in class for a red-hot trainer. I have to use on top here, and she has been on an off track before. Lady Kay (1) is dropping hard, as well, and had a wide trip before fading at the end in her last. Third start may be the trick. Group falls off after that. I bet the 5 to win/place and box the top two in the exacta. I will use the 5-1 over the 6-7-2-3 as a soft saver. 6th: 4-2-8-6-7-1…Cinder (4) gets the nod here, although she doesn’t appear to life a soft or yielding grass. If firm, she gets my “dot” play. She is a deep closer and needs someone to soften up the pace just a bit, but she loves the Churchill grass. Double First (2) was claimed last out by a barn that excels with first timers. Gets Lasix today for the first time, but also moves up in class for the first try on grass. May love all the changes. Dorodansa (8) didn’t really like her first shot on grass, but gets another chance today. Drops in class. I bet the 4 to win/place and the 4-2-8 in one exacta box and the 4-2-6 in another. 7th: 7-6-8-1-10…Wide open race here that begs the “all button.” If you are playing the Pick 3s, I would. If I have to settle on one, I go to Aztec Sense (7) who ran a good one here on May 2, closing big time. The extra distance today may help for a barn that knows how to win. Strong Breeze (6) is coming off a maiden win on the grass. May be good enough. Joey B (8) is a consistent sort, but looks to be a real hanger. Baseballnbourbon (10) is 8-1 ML and worth a look here. I bet the 7-6-8 exacta box and then the 7-6-10 box. I play the 7 to win/place lightly. 8th: 11-2-7-4-5-9…Another turf sprint that hopefully stays on the grass. I go with Front Pocket Money (11), who comes right back after falling completely apart at Keeneland in an allowance race that should have been a stakes. Gets a softer spot here and if he returns to old form, he could toss this group. Maniacal (2) is a horse I have been waiting to return. Was scratched out a couple of weeks ago, but gets the rail today. Has speed and a hot rider. Control Stake (7) is another one who wants the lead. And beat Maniacal two back. Forgive (4) is something we all need, truly. 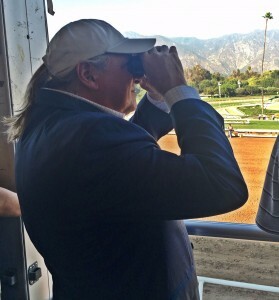 Trainer is off to a good meet and he is this distance’s expert. NY-bred tries Churchill for the first time off a win at Gulfstream. I box the top three choices, 11-2-7 and then the 11-2-4. I bet the 11 to win/place/show. 9th: 10-1-4-9-5-8-12…Loyalist (10) gets a “dot” here and my vote on top. Was claimed, again, by a trainer that formerly trained this horse a few starts back. Always a good sign to see a trainer go back and get one that was taken off them. He won easily that day for JR Caldwell and that was his last time in the winner’s circle. Patriotic American (1) lost to Loyalist three back, but came right back to win his next. Enchanted Rambam (4) invades from Hawthorne, where he won three of his last four. Stalker is moving up in class, but has not ever been better. Henderson County (9) picks up Lanerie and gets a huge drop from trainer Steve Asmussen. Can’t dismiss. I bet the 10 to win/place and key over/under the rest of them. 5th: 6-4-3-1…Carrumba (6) gets her third start off the layoff and should be primed for a big effort for trainer Shug McGaughey. Gets the blinkers on today and that is a huge angle for this trainer. Picks up JJ Castellano and looks to have the green light today. Terra Promessa (4) will be odds-on favorite and she should be off her fantastic performance against Stellar Wind in the last. Fantastic filly by Curlin has won over $700,000 already and looks like the speed here, too. But does she really want 11/8-miles? She struggled in her only start at this distance and she doesn’t look like, on paper, she wants the extra distance. May be vunerable today. Mo’ Green (3) and Power of Snunner (1) may be good enough to pick up some pieces today, if Terra falters in the deep stretch. I bet the 6 to win/place and key over/under the 4-3-1 in the exactas. 7th (note that the next Stakes race is in the 7th): 6-2-3-1-10-5…Another key horse for me in this one. No odds here, but Shaman Ghost should handle this group today. Four straight races with Beyer Speed Figs over 100. Ran a game second to Arrogate in the Pegasus World Classic. Choice here. Eagle (2) gets a huge jock improvement today and the dead closer is getting better with each start this year. Beat Bird Song in his last out, and Bird Song came back to impress Derby week. Watershed (3) is a classy stalker for Kiaran McLaughlin and should be the second choice here. I think Eagle may get him at the end today, due to added distance. Dolphus (1) ran a huge one last out for the same trainer as Shaman’s Ghost. Must be a reason in here today. I key the 6 over/under the numbers. I bet a 6-2-3 exacta box and a 6-2-1 exacta box in case the racing world falls apart. 8th: 5-3-7-12-13…I love Compelled (5) in this spot, but I have to admit I am biased towards Tom Proctor horses. He trained a good one for me several years back and I know how the guy works and how he trains. Besides that, though, this one is by War Front and should love this grass course. This filly caught two super fit horses in her last out and nearly pulled it off. I think she gets there today at 3-1 ML. Tough field, though, and it won’t be easy. Victory to Victory (3) gets a huge number and comes off back-to-back wins. Likes the lead and is proven over a yielding surface. Corporate Queen is another Casse horse, who will be trying grass for the first time. Faded against Oaks contender Ferrell in her last, but has the breeding to really like turf and she is at 20-1 ML. Have to use Happy Mesa (12) and Mercy Ann (13) some, too. I bet the 5 to win/place/show and in the exacta wheel over and under the rest of them. I think her odds drift up and she could get the perfect trip from a jock who knows this filly. 9th: 5-8-7-12-1-11…I put the “dot” squarely on Our Majesty (5) here. I loved her and put her on my HTW list after her first start. She was disqualified in her second start (another win) in a dubious steward’s decision, but came right back to impress at Keeneland. Steps it up big time today, but this girl can do it against a tough field. Nonna Bella (8) faltered late in the Gulfstream Park Oaks against Salty, who was highly touted for the KY Oaks. Bode’s Dream, another Pletcher filly, won her first three career starts before getting beat a neck. She got some time off after a disappointing run in the Forward Gal, but looks to be training great again. And, if you follow me at all, you have to know that I love Pretty City Dancer (12). She has had three tough races in a row, but gets back to sprinting today. Got to think she will show a little of her old form here. I bet the 5 to win/place and then key over and under the rest of them mentioned above. 10th: 10-2-4-5-7…Another key horse here in Richard’s Boy (10). While the last race is deep and wide, this one isn’t so much. If Richard’s Boy can make the trip back from Dubai to California and now to Baltimore in good order (and it looks like he has been training good), then he gets the “dot” here. Ameilia’s Wild Ride (2) is coming off a huge layoff to tackle this crowd, but appears to run good fresh. Pay Any Price (4) is all speed and loves 5 furlongs on the grass (6 wins in 9 starts). May forget to stop. The sentimental favorite will be Ben’s Cat (5). The 11YO won this race a year ago, but that’s the last time he was seen in the winner’s circle. Obviously, he loves this distance and this track (7 wins in 11 starts her), but has he lost a step? I bet 10 to win/place and key over/under the rest. 11th: G2 Black-Eyed Susan: 7-2-9-10-5-6-1…Wide open race now that all the runners in the KY Oaks have opted for time off. So wide open, in fact, that I go with a filly jumping up off a maiden victory in Moana (7). Lightly raced, for sure, but not without talent and skill for trainer Todd Pletcher. This daughter of Uncle Mo was purchased for $300,000 and comes in off two route races, including an impressive victory at Keeneland. This pure stalker looks like she will love the added distance. Tapa Tapa Tapa (2) gave It Tiz Well and Benner Island all they wanted in the G2 Honeybee, who she faded at the end of 11/16 miles. She’s going farther today. Summer Luck (9) had a tough trip in the G1 Ashland at Keeneland. Goes back to Castellano, and that is a huge jockey change. The only question here is whether she wants to go this far. Talent is not a question. Actress (10) is another lightly raced filly and is still a MAIDEN, after two straight seconds to start her career. But she is by Tapit. And grey. And, talented. And, looks to want more ground than her previous two outings. Don’t dismiss. Lights of Medina (5) is another Pletcher horse. Won her last out in the slop at Laurel. Looks to be a cut below, but she is in Pletcher’s barn for a reason. I bet the 7 to win/place/show. I bet a 7-2-9 exacta box and then a 7-2-10 exacta box. I may key the 7 over and under the rest of them listed above (5-6-1).